Wow! How is it the end of May already?!? Time flies when you are having fun I guess! How have you all been? Things have been busy here. Wedding invitations are keeping me hoppin'. If you haven't stopped by in a while, you really should! We have TONS of new product in stock including Basic Grey's two new lines: Cappella & Max & Whiskers (oops, almost typed Max & Ruby....all you moms that watch Treehouse will know what this is!). There are also lots of great items for scrapbookers including letter stickers, embellishments, the new Prima flowers and more. Stampers will notice all the new Stampingbella stamps and the adorable Smooch Spritz in ALL colours!! We have an extended Retrofest special going on....for this week ONLY, shop in our clearance area and save an EXTRA 50% off already reduced items! Honestly, the deals are amazing! I think I saw some Technique Tuesday alphabet stamps that were $42 and now are only $10.50! All of our 12x12 sale paper is now 4 for $1.00! Truly it is worth stopping in! We are now on to our last round of card classes before we take our summer break. Michelle will still be offering her gorgeous scrapbooking layouts this summer every 4-6 weeks. If you haven't tried scrapbooking, you would honestly LOVE her layouts....this could be the summer where you start documenting your life or the life of someone special. It's so funny, but I am big on documenting the little things like how Julia always picks the pink Flintstone vitamins first and then the purple and then lastly the orange (why? I don't know) or how Coulter loves raspberries so much. It's those little things that you WILL forget. NOTE: The COPIC technique class with Linda (scheduled for tonight) is CANCELLED due to her fractured wrist. We will be setting a new date within the next 2 weeks (it won't take place for about 6+ weeks from now...once Linda's cast it off). I will post details once confirmed. As usual, advanced payment is required for the class to secure a spot. You can call to register and pay via credit card or stop by in person. All classes must be paid within 48 hours of registering or your spot will be released. Masculine cards....I know you all struggle with these! Let Debbie take away your fears with these two great cards just in time for Father's Day. And these cards are packed with technique! You will work with Tombow markers, Smooch Spritz, edge punchers, twine, paper piercing, embossing and making embossed paper using a Scor-Pal. Ooooh! Look how girly these cards are! Pauline has worked with two of Stampingbella's most gorgeous stamps. You will work with Prismacolor pencils and learn some shading secrets to really make your cards pop! What I like about these cards are the extra embellishments that you will make. Check out the paper rose and beautiful ribbon flower! Please note that this is a technique class and pencils are required. Required Supplies: Scissors, adhesive, white thread, needle, Prismacolor Pencils (908, 912, 926, 928, 937, 943, 947, 988, 992, 993, 995, 1003, 1005, 1014, 1015, 1088, 1091, 1096, 1098) Each pencil is $1.75 and available at the store. Once again, Michelle has designed a gorgeous one page layout with lots of technique and dimension. You will learn how to create the flower and leave accents. She will also teach you a great folding technique (see the detail on the large circle). Of course, distressing and working with liquid pearls are also a part of this layout. I just wanted to touch base to let you know about some of the things coming up and things coming to a close at The Pickle. Last Friday's Happy Hour marked the end of our sessions for the season and it went out with a bang! Kell taught a gorgeous thank you card using the NEW Smooch Spritz ($5.50). This product is sure to leave your projects shimmering and you smiling! We have been thrilled with the response and appreciate you coming out to the events. We had so much fun teaching you how to use some of the new products in the store! Now that the nicer weather is here, we will take a break and start up again in late fall. 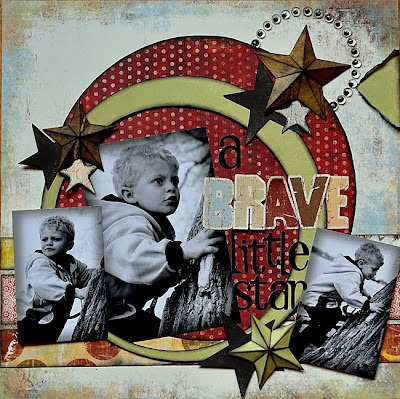 Michelle has designed a gorgeous one page layout for her next class. You will learn how to make those crafty dimensional stars, work with baubles, chipboard and decorative paper. As usual, distressing will be a big part of the layout! Did I mention how much I love this girl's style?!? There is still room available in Linda's class. This will be Linda's last class until fall due to her ridiculously busy 'touring schedule'! So if you are debating about taking the class, just DO it! You don't want to miss out of learning how to use these amazing markers and pencils! There are still a few spots available in Pauline's class. See below or follow this link to see the cards! There are still a few spots in Debbie's card class. See below or follow this link to see the cards! Give us a call at the store to reserve your spot.